The 80,000-square foot waterpark at Great Wolf Lodge in Gurnee, Illinois. Published Sept. 14, 2018 at 9:01 a.m. 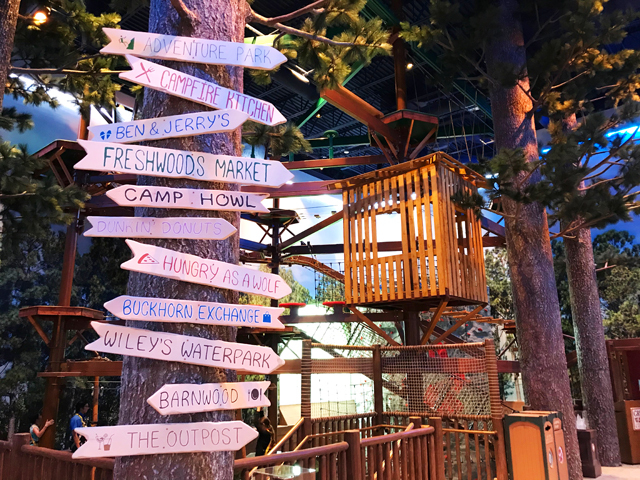 When Milwaukeeans think Great Wolf Lodge, their minds most likely travel to the Dells. I know my mind does, because that's where my family first experienced the glories of the indoor water park. But now, the former Key Lime Cove at 1700 Nations Dr., in Gurnee, Illinois, has been transformed into a Great Wolf Lodge, too, and, other than Country Springs in the Ingleside Hotel in Pewaukee, this waterpark is the next closest to Milwaukee, edging out Blue Harbor in Sheboygan (which was built by Great Wolf Lodge and sold in 2011) by about 6 miles, based on a departure from City Hall. Great Wolf owns the largest group of indoor water parks in the country, so they know how to do things right. 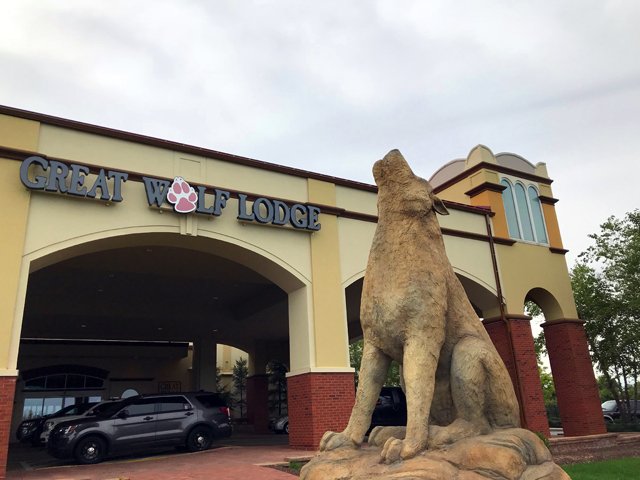 While the waterpark itself doesn't appear to have changed all that much (there are new attractions, which I'll get to), the property did get a makeover and I like that Great Wolf seems to have thought of most everything. For example, when you go to the waterpark, you don't want to have to bring your room keys and wallet (or fork out still more money for an expensive locker). 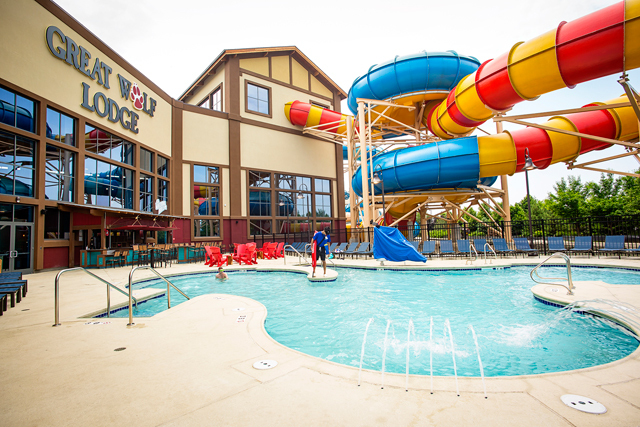 Great Wolf puts your credit card info on your waterpark wristband, which also opens the door to your room, allowing you to leave your valuables behind. Having said that, the room had no safe, which is an amenity we use every time we stay in a hotel. Still, we found what we think were suitably creative hiding spots and, of course, everything was still there when we returned. 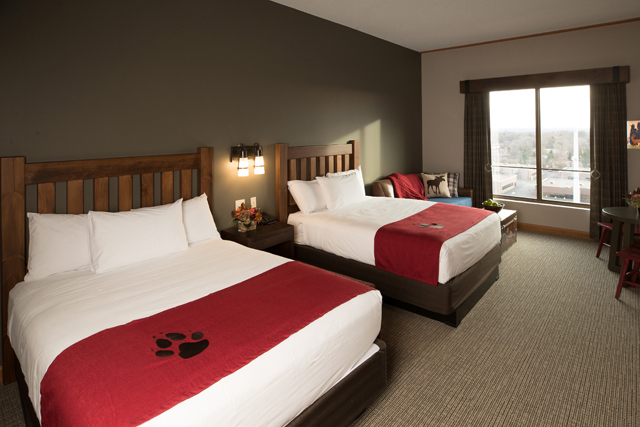 The hotel rooms were clean, neat and simply designed, and are available in more than a dozen configurations, including kid-centric ones like the Wolf Den and KidCabin suites that have bunk beds and character themes. All rooms have a coffee maker, TV, hair dryer and refrigerator. The 80,000-square foot waterpark also has most everything you'd want. There's a wave pool, a kiddie pool, an activity pool with basketball hoops, an outdoor pool, a lazy river, a bar, a couple good dining options, cabana seating, towel service, a couple raft slides, a couple body slides and what my kids call a toilet slide – you know, the one that swirls you around as if you're in the loo at flush time. Great Wolf has also added a pair of family raft slides that boasts a raft elevator so you don't have to haul those giant inflatables up the stairs yourself. In the center is the multi-level treehouse water fort with suspension bridges, slides, sprayers and the giant bucket that thrills kids with periodic drenchings. The only thing missing was a hot tub in which daddy could enjoy his pina colada. On a two-day visit, my family spent half the time at the waterpark and the other half exploring the rest of the resort's charms. 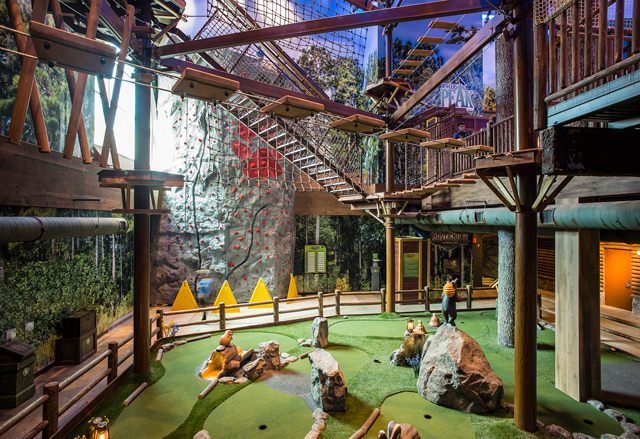 Those include, among other things, the most brightly lit arcade you've ever seen, a ropes course, a climbing wall, a mining experience, a Ben & Jerry's, a Dunkin' Donuts, a couple restaurants, a miniature golf course, mini bowling and a bulk candy store. Much to the delight of my kids, there was also MagiQuest, a live-adventure game in which players follow clues and use their interactive magic wands (an ingenious unspoken link to Harry Potter) to find a series of runes and relics they need to fend off a dragon. That, by itself, kept them happy, engaged and entertained for a few hours. 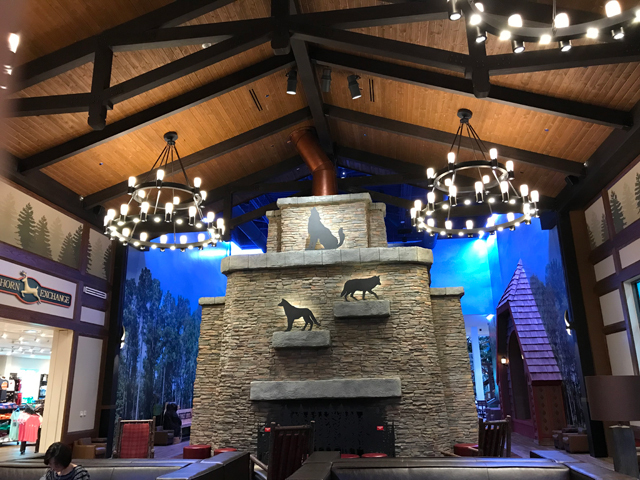 As at other Great Wolf Lodge locations, the grand lobby is also the scene of a hubbub of family friendly activities, from craft projects to storytimes and more. Of course, there are also some good dining options, including the attractive Barnwood, which has a nice bar area that offers views over the waterpark action and out into the lobby. If not for the I-94 construction, we'd have made the trip in about 45 minutes (with no tolls if you take 41, which gets you there just as fast as the Illinois Tollway). With the lane closures, the trip took about an hour. As the temperatures start to wind their way down, remember that it's always summer 45 minutes to the south.